What to do on the Isle of Man? I'd probably recommend visiting Peel for a wander round the old streets, maybe the castle and the coast, especially at sunset. Just south of there is a little place called Dalby/Niarbyl where there are some more great coastal views and walks as well as a pub and cafe. Also, I'd suggest the village of Cregneash and possibly its living museum. Port St Mary is a nice quaint fishing village just down the hill from there. In Douglas the museum is worth at least a quick visit. Up north, the Point of Ayre is quite breathtaking. The village of Laxey on the way up there is quite pretty. If they know anything about the annual TT races, perhaps a trip around the course would be worth doing. Otherwise, I'd just say head for the hills for a bit of a walk. I was typing it out on the iPod touch, so the responses were getting shorter as I went on. I also didn't know what his friends would be interested in seeing, or how much time they'd have, so I tried to keep it general enough that any visitor would like it (though I'm aware it centres around places I love to go to take photos). I must say, despite my 'quick visit' recommendation, the Manx Museum in Douglas is well worth more than just a quick visit, as long as you've got the time to spare. Have you been to the Island, or live there? What would you add to the list? 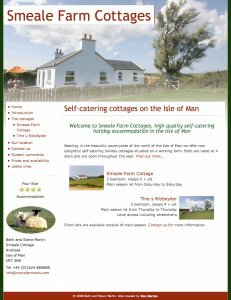 Read more about What to do on the Isle of Man? A group of Applied Business students from St. Ninian's High School in the Isle of Man is holding an art auction on 29th January in aid of Age Concern. Over 40 local artists have donated artwork for sale in the auction which will hopefully produce a nice donation to charity as well as a great thing to put on the organisers' CVs. The organisation of this event significantly trumps my involvement in a Young Enterprise group as part of a similar scheme when I was at school. We managed to make some novelty items and Christmas decorations as well as coming out with a slight profit for members of the group, but nothing quite on the scale of this. When I first started adding road network data for the Isle of Man into the OpenStreetMap project, there were only a few map sites online that had maps of the Island, and none as easy to use as the Google Maps service (which at the time did not include maps of the Island, and still doesn't to this day) which rocked the world of web mapping when it launched. As I recall, the sites with maps of the Island at that time were limited to MultiMap and the Ordnance Survey Get a map service. Map of roads, railways and railways stations (marked incorrectly with British Rail logos), rivers, plantations, reservoirs and long distance footpaths. Does not allow zooming in to towns for detailed street maps. Map of roads, rivers, some plantations and reservoirs. Includes detailed street map information. Map of terrain, roads, railways and railways stations, rivers, plantations and reservoirs. Includes detailed street map information. Island incorrectly attributed to the UK. Map of roads. 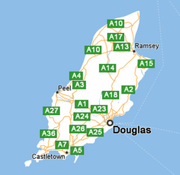 Does not include detailed street map information (streets disappear from map beyond a certain zoom level) but does include the Ordnance Survey 1:50,000 map of the Island if you hover your mouse over the 'map' toggle to the left of the map. Map of roads, railways and railways stations, rivers, plantations, reservoirs and some long distance footpaths. The town street maps are not very detailed yet. Map of main roads and some rivers. The map disappears past a certain zoom level, but they do have excellent aerial imagery for the whole of the Island. Map of terrain, roads, railways and railways stations (marked incorrectly with British Rail logos), rivers, some plantations and reservoirs. Includes detailed street map information. I've included all the draggable ("slippy") map providers - or at least the ones I can think of right now - to give a bit of an overview of how their coverage differs, and also give a bit of a glimpse into the differences between their cartography and general feel of the maps. Also worth a mention here are the street maps that the Government provide for most towns across the Island. 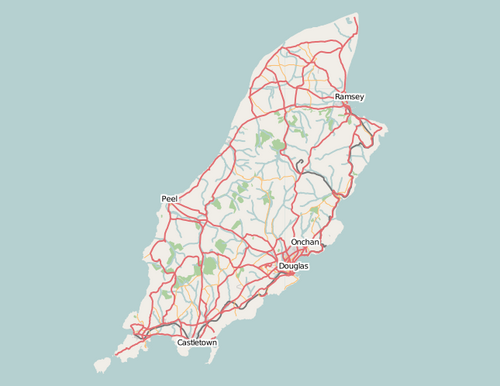 With all these mapping services providing maps of the Island for free, is it really still worth continuing to build up the map data in the OpenStreetMap project? Of course it is! These maps are nothing but that: static maps, and some of them really great ones at that. They are great if all you want is a static map, somewhere to share a single location with someone else, or even the ability to overlay your own information on top of the map using that provider's API. The whole point behind the OpenStreetMap project though (and to a certain extent, the People's Map project) is that the underlying map geodata is available and re-usable under a free license for you to be creative and do what you like with that data. Maybe you're working in conservation and want to create a map showing all the rivers and different habitats on the Island, but not include roads. Maybe you are a walker and want to create a map that shows just the footpaths on the Island. Maybe you run a local listings site and you want to create a map that shows only the locations you want it to show and hide things that may not be of interest to your visitors. There are many possibilities, and the great thing is that if you have an idea, you can go off and use the data we're building up, allowing you to fulfil your idea without having to use the prescribed maps that are provided by the big providers. Note: all the maps included above are copyrighted by their respective owners, and are included here under fair dealing clause for comparison of their individual benefits. 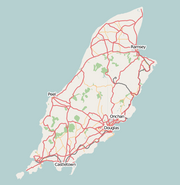 The Isle of Man is going to be having its first OpenStreetMap mapping party on Saturday 1st September, with the main aim of mapping the Island's capital, Douglas. 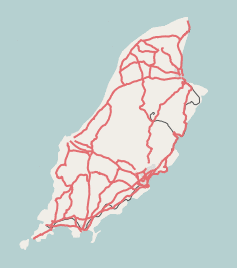 Details are pretty sparse at present but I'll be fleshing out the Isle of Man mapping party information over on the OpenStreetMap wiki. If you're interested, please add yourself to the list over there. If anyone is thinking of travelling from outside of the Island and would like advice on getting to the Island, or somewhere to stay, let me know. 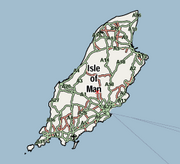 The map of the Isle of Man is the featured image this week on OpenStreetMap so I think now is a good time for the State of The (Manx) Map post that I've been considering doing for a while. (Obviously borrowing ever so slightly from the name of the upcoming State of The Map conference in Manchester... have you registered yet?). 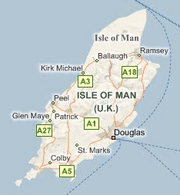 The overall coverage of the Island is great thanks to the assistance of the Isle of Man Government, as you can see from the map below. Much of the detail from the government map has been included in the OpenStreetMap data, although I'm sure there are some features that have been overlooked to date. The gaps in the map start to show when you zoom in to specific areas. Taking Douglas as an example, I'll show what level of detail is available and what will need local assistance (and possibly a mapping party) to get the town maps to a usable level of detail. 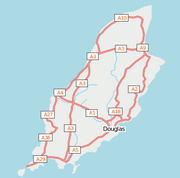 Douglas has the majority of its major routes mapped already, but it's missing a lot of the detail in between, like smaller roads, housing estates, pathways and the like. Where these do exist in the map already, they usually do not have a name associated with them, and almost never have all of the cul-de-sacs and such mapped out. The likes of Castletown have more of their roads covered (it's smaller, and much easier to cover them) but likewise doesn't have the names of many of the smaller streets. Port St Mary is covered pretty well, including names, thanks to the support of one guy and his bike. If you live in a place that's missing detail, you have an opportunity to help... Let's try and beat Google Maps to coverage of the Island! 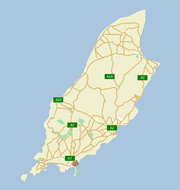 On a related note, it's great to see as well that some other free maps of the Isle of Man are surfacing on Wikipedia, licensed under a Creative Commons license. Best of all, the image is in vector format and so can easily be altered to illustrate things with ease (it's perhaps a good starting point for the TT Course map I started last month). 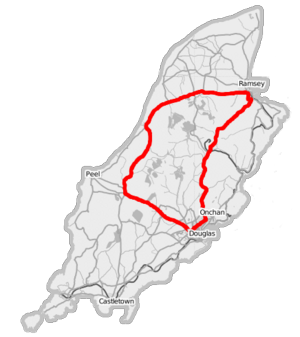 In just over two weeks the Isle of Man will be celebrating the Centenary of the famous Isle of Man TT Races and Wikipedia's section of articles around the topic of motorcycle racing on the Island has been quickly expanding, reflecting the interest in the event. With OpenStreetMap's map of the Isle of Man improving, I offered a little while back to create a map of the TT course to help illustrate the articles on Wikipedia. It turned out not to be quite so simple, however. The course itself is covered on OpenStreetMap but the location of points of interest around the course is not. The information about milestones, viewing points and other points of note around the course is available in part on Wikipedia, and more so on other sites, though nowhere is it available in the public domain or in a reusable fashion. I'm ever hopeful that I might hear back from the Department of Tourism at some point, allowing the use of this important location data, or perhaps from someone who's actually travelled the course and collected this information for themselves with their GPS. In the meantime I've gone ahead and created a basic overview map of the course as a bit of a teaser. When I get back to looking at this, I also need to find a more efficient way of taking OpenStreetMap data of the Isle of Man, filtering out the bits I want and highlighting them on top of a faded base map. I'm a little embarassed to admit I just used GIMP to make this simple overview map. When I wrote my last post about the difference between Google Maps coverage of the Isle of Man and that of OpenStreetMap, I hadn't realised that the OSM version could have been even better without too much more work. 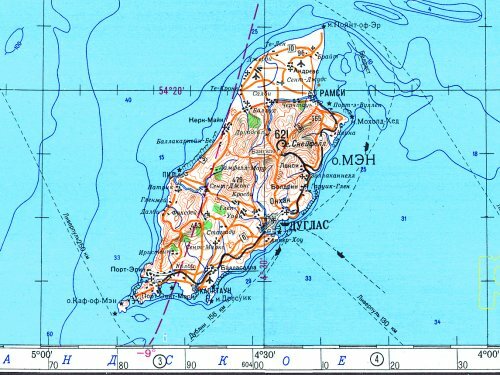 I discovered it only recently, but two weeks prior to my post, Nick Black had posted to his blog about mapping the Isle of Man as well. Nick had been in touch with the Isle of Man's Department of Local Government and the Environment (DLGE, or DoLGE) to see if OpenStreetMap could benefit from any of the mapping data that the government own the rights to. They responded positively to the request and offered a licence to freely derive information from their 1:100,000 map of the Island for use in the OpenStreetMap project. In doing this, the Isle of Man Government is one of the few cutting edge (a term I wouldn't normally find myself applying to government) organisations leading the way in contributing its data - even if only a subset - to the world of open geodata. At a scale of 1cm on the map to 1km on the ground, the geodata is only a very simplified version of that collected by the government, yet it can still help tremendously. 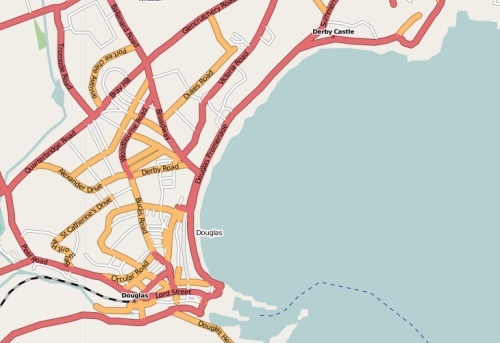 As Nick pointed out in his post, the Isle of Man did have a fair number of roads covered on OpenStreetMap already, but the coverage was by no means thorough or complete, which is where the new data can help. It helps fill in gaps where roads had not already existed in the database. It helps in the classification of roads between primary (A-roads), secondary (B-roads) and others and helps with assigning the correct reference numbers (e.g., A1) to the roads. The data also helps with the perhaps more difficult to map features such as plantations, peaks, rivers and reservoirs. Nick has spent some time tracing from the map, as have I, and the open geodata map of the Isle of Man is starting to be beefed up (switch to the Osmarender layer to see the latest map data, though you'll need to zoom in) to include more roads as well as everything else we can derive from the map. Due to the scale of the government map being used to derive data from, there will be issues in data quality and accuracy, but it is a great start and gives us a broad base set of data to work from, all of which can be improved over time. And it can be improved by anybody who is willing to help. This is still especially important in the towns and villages of the Island where the mapping will still require a lot of work, partly because generalisation on the 1:100,000 map means that many smaller roads are excluded but also because street name data is still something which needs to be collected in other ways - the best of which is by people on the ground who have knowledge of the area. I wonder if other governments will step forward and offer a helping hand as well? Some of the cartographers on the OpenStreetMap project (which includes the chair of the Society of Cartographers in the UK) got together a few weekends ago for a cartography discussion day to try and clean up the rendering of free geodata from the project. The results of that day are now starting to appear on the maps, with much of the extraneous detail being stripped until you zoom further in, revealing more on each zoom level so as not to clutter the smaller scale maps. 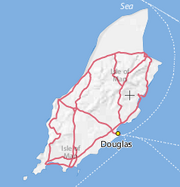 With the changing of the maps I wanted to see how the Isle of Man was looking. I have to say, it's looking even better than the previous big update to mapping. When I first learned about OpenStreetMap at the Open Geodata Forum I wasn't entirely convinced it would take off, though I was intrigued by the concept. Almost two years down the line and my opinions have definitely changed on that, as have the opinions of many others, including people in the geographic information industry. 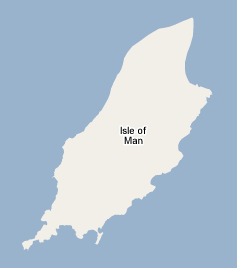 To see why my opinions have changed, just compare the open street map of the Isle of Man to the Google Maps version which shows nothing except its name and an outline of the Island (with the Calf of Man joined at the bottom as if a bridge had been built to the islet). With open geodata anyone can just go in and add new information or alter existing information if there are errors in it (like the link between the Calf and the mainland, for example) but you can't do that on Google Maps. Admittedly the Manx map is still somewhat lacking in certain areas, but it's a work in progress and it's getting there, slowly. Before the fall of the Soviet Union, they put a lot of energy into mapping the rest of the world, at small scales like the section of map above, but also at larger scales for certain places of key interest to the Soviet government at the time. The more detailed larger scale maps were deemed by the Ordnance Survey to be copies of British mapping and so although the maps are copyright free (Russia didn't believe in copyright when these maps were being produced) it is questionable as to whether they can be reused in the UK*. 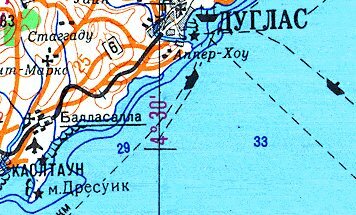 You can read much fascinating information about Soviet mapping on John Davies' Soviet Military Maps of Britain site, but I just wanted to share this interesting Soviet cartography of the Isle of Man with names transposed into Russian. The original map image is available from the Poehali website. 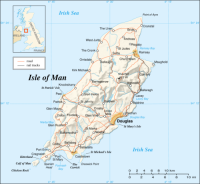 * The OS specifically call out 1:25000, 1:50000 and 1:100000 mapping, so I hope posting this 1:500000 map extract of the Isle of Man won't cause any problems.